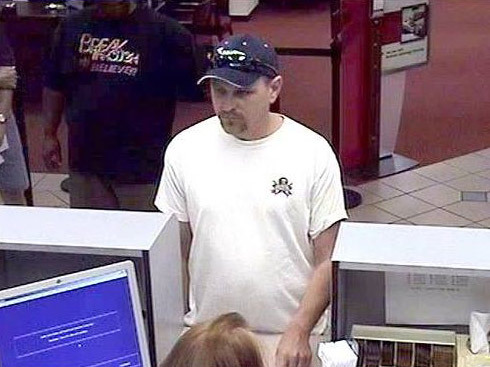 Kevin Cotterman, the 42-year-old serial bank robber who stole $805 from the Palm Coast Bank of America branch on Palm Coast Parkway in May 2012, was sentenced today (Oct. 8) to 15 years in prison, with no possibility of parole, by Flagler County Circuit Judge J. David Walsh. Cotterman pleaded no contest in January. He tried to withdraw his plea today. Walsh refuted the attempt. Because he is a repeat offender (he served three years in prison for bank robberies in 2008), Cotterman is ineligible for early release. He owes the $805 in restitution to Bank of America. The 36-year-old teller complied, placing money in denominations of $20, $10, $5 and $1 bills in an envelope. No $50 or $100. The teller handed the envelope to Cotterman, who was, all the while videotaped by the bank’s surveillance cameras. He walked away. She pressed the hold-up button and informed the bank manager. On Tuesday, the Seminole County Sheriff’s Office arrested Cotterman–it’s not clear why or how, though the charges against him from four counties are quite clear. Beside the robbery and grand theft charge he faces in Flagler, he is charged with strong-arm robbery with a firearm and a strong-arm robbery without firearm on warrants from Duval County. He’s charged with grand theft, robbery and possession of ammunition by a convicted felon by Orange County. And he’s charged with two counts of attempted robbery in Volusia County. Seminole authorities are familiar with Cotterman. He served two and a half years in prison for a succession of three robberies he carried out on Oct. 7, Sept. 3 and Sept. 17, 2008, in Seminole, and was convicted to three years, which he served concurrently. He was released the day after this past Christmas. He’s unlikely to leave jail any time soon: his combined bail was set at $750,000, including $400,000 bail set by Flagler County Circuit Judge Raul Zambrano. A tip received by Crimestoppers tip line in Deland identified Cotterman as the suspect in two Deland bank robberies, the Flagler County Sheriff’s Office said in a release. Flagler detectives said they were able to match Cotterman to security photos taken in the Palm Coast robbery. 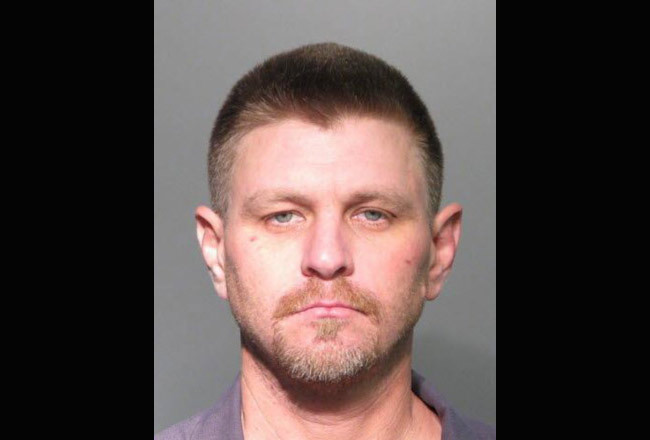 The detectives traveled to Seminole County Thursday to serve the arrest warrant on Cotterman, who confessed to the crime, according to the detectives. 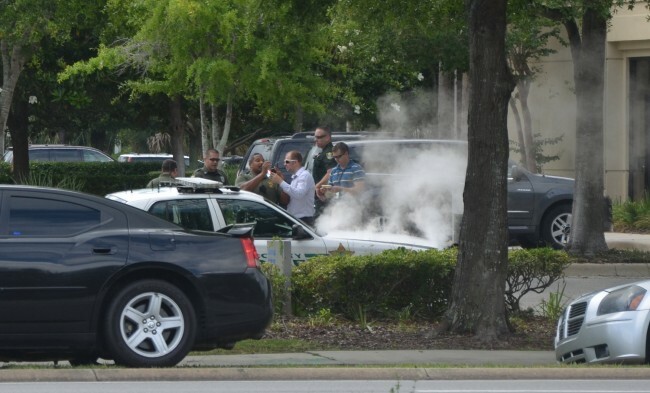 Below is the May 17 story on the Palm Coast bank robbery. 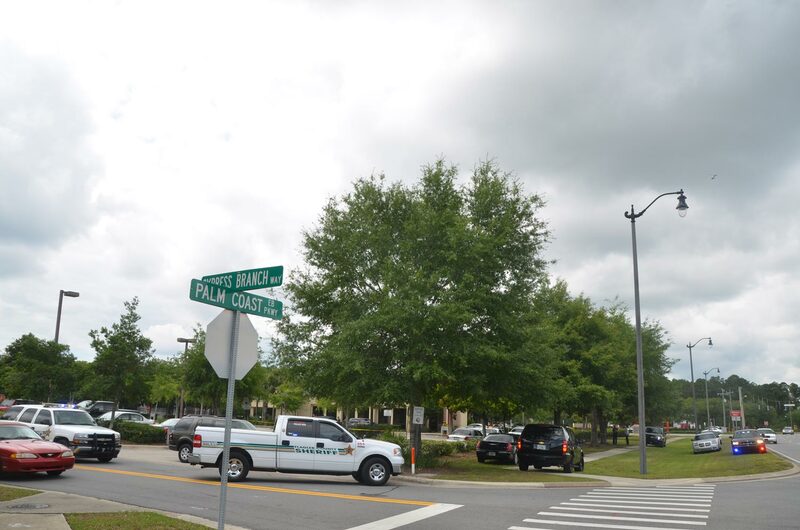 May 17–The Bank of America on Palm Coast Parkway near Belle Terre Parkway was robbed just before 11:30 this morning. The bank robber, or robbers, got away, triggering a search by ground and air. Fire Flight, the county’s helicopter, has been circling the area above the bank, in large, concentric circles, since shortly after the robbery. A dozen or more Flagler County Sheriff’s units are at the scene. The bank parking lot has been sealed of, but bank officials and cops are walking in and out of the bank, suggesting that there is no further danger inside the bank. A little over two years ago, the Bank of America in Bunnell was robbed by a man claiming to have a bomb. 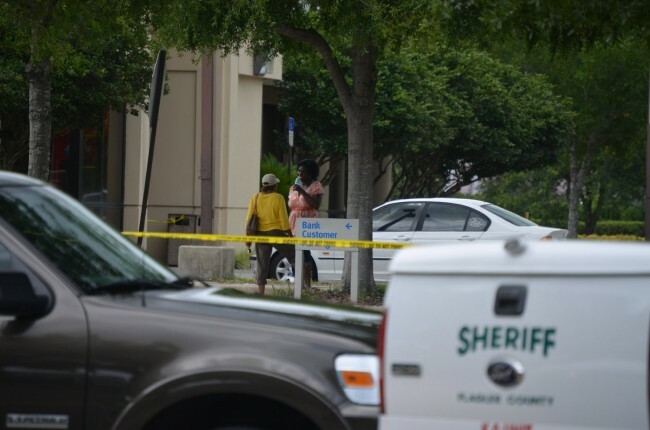 The block around the bank was sealed for hours and was not reopened until the bomb squad from the St. Johns County Sheriff’s Office removed the object–which turned out not to be a bomb. No Flagler County Fire Rescue or Palm Coast Fire Department units were called to the scene, suggesting that there were no injuries. Just after noon, the Flagler County Sheriff’s Office said that the robbery was carried out by one man who fled on foot. The suspect is described as a white male, approximately 35 years of age, six-feet tall, wearing a beige cap, white t-shirt and khaki shorts. He has short, light brown hair. Anyone with information on this incident is asked to contact the Sheriff’s Office at (386) 313-4911. Traffic on Palm Coast Parkway is unimpeded. This is a developing story. More when it becomes available. Did I not just read an article yesterday about how crime is down in this county ? OOPS ! Crime being down in this county does not mean crime doesn’t exist in this county. OOPS! The crime rate is down but it doesn’t mean it’s eradicated, nor will it ever be neither here or anywhere else. He did not rob BOA. He, a mere ordinary jonnytaxpayer, just isn’t allowed to do to BOA what it has done/ is still doing to all the taxpayers – robbing us blind! And look, we even have to foot the bill for this EXPENSIVE manhunt for BOA. The irony…but it ain’t funny! Little robber robs humungous robber. Humongous robber robs US taxpayers. Brian T. Moynihan, CEO of Bank of America. that was actually stolen from us! You have to admit, that’s a clever disguise he used…..
it doesn’t even say anything about the man being armed. Of course he was armed. Can’t you see he has two arms ? They are never going to find him, FCSO is looking for someone with a beige cap. He was wearing a blue one. Looks like they found him! Too bad – I was hoping that he could elude prosecution, like the CEO of Bank of America, who along with other bank CEO’s managed to wreck our home values and throw us into the street. Believe me – the banks don’t give two sh**** about their customers or their employees. But most of you readers know this. Kevin Cotterman is a SAINT compared to these wealthy and influential crooks. I really am sorry to hear of this development. seriously, geezer?? are you implying it is ok to rob with threat of violence because you deem their business practices ethically wrong? Let me ask you…have you ever been the victim of a violent crime? Trust me, if you had, you would change your opinion. You know who’s not sorry? The innocent tellers just doing their jobs who had the life scared out of them by this man. Forget how you feel about the institution and think about the people who for a moment thought their lives were in danger. Boy, we all are getting to know the Banksters so well I don’t even need to write anything! He couldn’t possibly be the robber. He is to handsome to be a bank robber. Must be mistaken identity. seminole county caught this thug while flagler county’s finest were in dunkin’ donuts…unbelievable. I loved all these comments. They gave me a darn good chuckle. It’s nice to know that some people besides myself can be sarcastic. I think his problem is that he is unemployed. If he had a job he wouldn’t steal. I place the blame squarely on Obama. With the money he spends flying around he could give this poor soul a million. All these people making excuses for this guy…I bet they wouldn’t be quite so generous in their assessment if the guy had been anything but Caucasian. Parole and early release are two different things. Parole is a system whereby inmates can be released early frequently under probation supervision) if they are deemed by a parole board to have been rehabilitated. No inmate sentenced today has a possibility of parole, because parole was abolished for all newly sentenced inmates in the state of Florida back in the 1990’s. The state Parole Board now only exists to serve inmates who were sentenced before that date. Early release is a different thing. Under that system, inmates may EARN gain time that is then discounted off of their sentence. There’s no board giving thumbs up or thumbs down, just performance evaluations turned in every month determining how much of the maximum 10 days credit they get that month, up to the statutory limit of 15% off of their sentence.